Just after Google I/O finished and Android 3.1 started popping up on XOOMs across the nation, we quickly realized that its newly announced movie service was not so root-friendly. That’s right, Google or its contract with the movie industry, must have figured that since your device may be rooted, you planned on doing nothing but stealing from them and blocked your access. So that XOOM you bought, which came with the ability to be unlocked, can no longer access all of its services unless you lock it up tight again. It’s only getting better though. The new Blockbuster app for the DROID Charge that became available this week, actually calls you out for being rooted and even proceeds to tell you that you will struggle to enjoy its content. 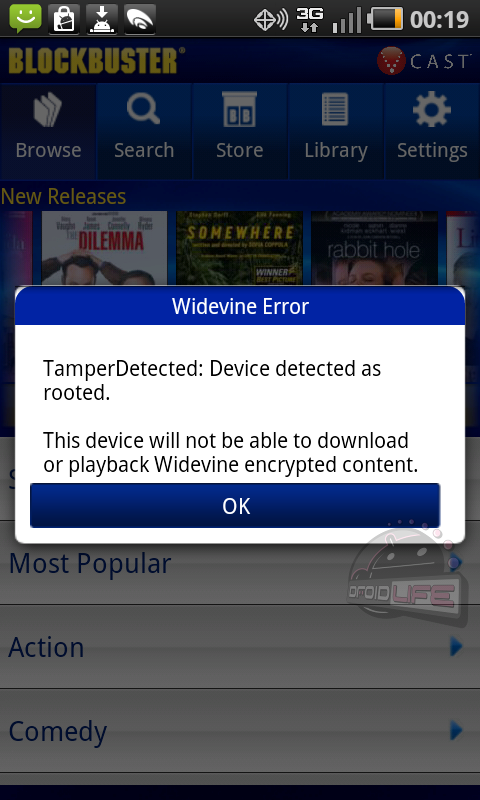 The app comes equipped with Widevine’s DRM software that has the ability to detect whether or not your device has been left untouched in the system department. Oh and speaking of Widevine, did you know that Google owns them? Who would have thought? Welcome to the future of rooted users, my friends.